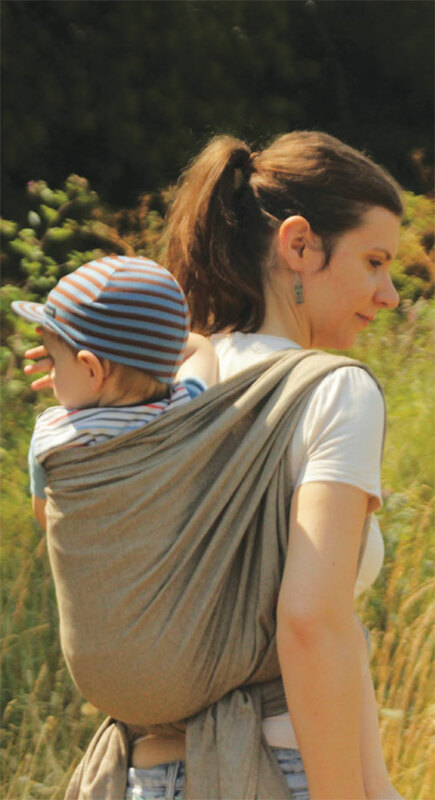 We heartily recommend the Nandu baby sling to all parents, who want to know their child at their fingertips. The slings are made with lots and lots of love, and the experience of hundreds of Hungarian parents have helped its creation. Thank you! Our vocation with Nandu is to introduce babywearing to every family with a baby, and to support them in creating their own harmony. 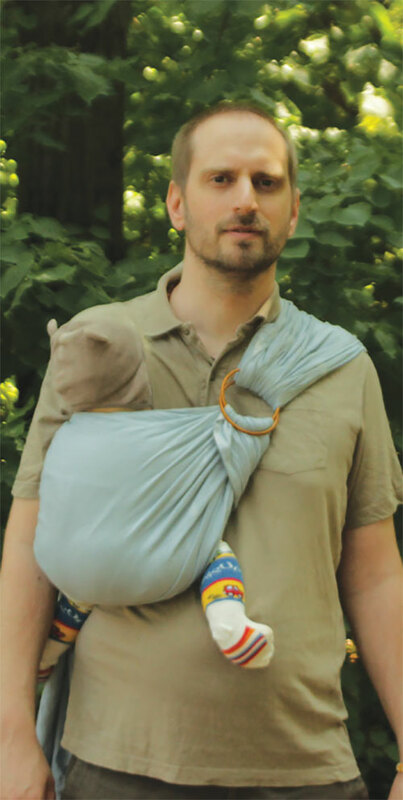 As many ways babywearing may help families, as many are of them. New-born babies have a natural need for constant proximity – even as a foetus, he was curled up in a pleasant environment, fed through the umbilical cord, rocking in the mother’s body. After birth, this is the most perfect state that he instinctively wants. The most critical period in a baby’s life is the first six-twelve months, as this can be the base for his attitude to life. He may easily get along, or life can be a struggle. Experience shows that babies who are close to our body are more relaxed, more balanced, more interested, and they become independent sooner. The question often arises: do I spoil my child by carrying him, by babywearing? I can only spoil him and elongate his childhood, if I give him something else instead of me, when he would need me, my proximity, and my attention. Later, even as an adult, he may try to fill the resulting gap, which may cause many inconveniences to the parents and the children as well. While wearing the baby, we can almost effortlessly give him the attention, proximity, safety, rocking, and the possibility to hide and to fall asleep. Babywearing helps to form the unity of mother and baby, helps getting to know our baby, his signs and needs. In their mental and physical development, the stimuli they get while being carried play a great role. The motion, rocking and moving promotes the development of the nervous system, the movement system and the brain functions. The baby pays attention constantly, he learns and soaks up the habits of his environment, while feeling safe all the time. Proximity helps breastfeeding: we learn to recognize and feel the baby’s needs swiftly, and we can breastfeed easily while wearing the baby. Both of our hands are free, so we can do our regular housework or gardening without having to put the baby down. It makes using stairs – also in high-rise houses without and elevator –, and using public transportation easy. You can do the shopping, participate at various programmes or hike without any obstacles, and you can also breastfeed discreetly, without having to stay at home. It helps being together with elder brothers and sisters, while showing an example for baby care. Babywearing is a great way to calm the baby, to help the baby fall asleep, and to get over the often gruelling, grouchy periods. The baby always has to face our body while we carry him, so he could place his head on our chest when he feels tired or when he wants to hide from the noisy outside world. Whatever type of carrier we choose, it is really important that the baby could be in the foetal position, because this is what makes him feel safe and what calms him. His legs should be sufficiently high, the knees should be in a comfortable spreader position, and the back should form a C.
The good and proper carrier is sufficiently tight and hugs the baby all around. You may carry your baby in the front, on the back or on the hip, depending on the baby’s age, weight, the needs and possibilities of the family, and the available carrier as well. We wish all parents wholeheartedly to explore what a beautiful experience it is to carry our baby above our heart! 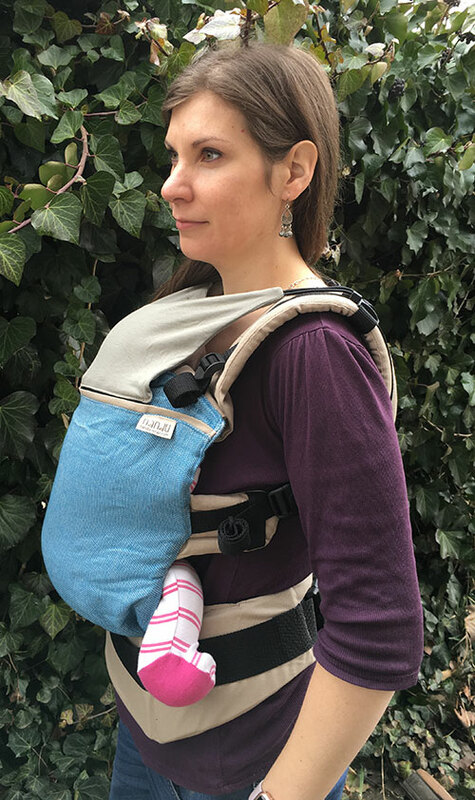 The most important aspect to keep in mind is to place the baby in the sling in a position that allows her to have a 2 fingers wide space between her chin and her chest! HOW TO WEAR YOUR BABY CORRECTLY? Tightly, by supporting the baby’s back all around; the baby carrier should reach from the back of one knee to the other. The knees are high, the pelvis should face inwards and downwards. The spine should be convex, just like in the foetal pose. Anatomically, for the formation of the hip joints, the best for the baby is to have her legs spread in a 90 degrees angle in the carrier. Viewed from the front, the legs should form an M shape. The stems of the letter M are the legs, the middle is the baby’s bottom. The legs should not hang, and they should not be in a split position, either. We shall find a position that is comfortable for the baby. The knot shall be so tight that when we lean forward, the baby does not lift off from our body. The right height for the baby is to have her head and inch (a few centimetres) under our chin. We can babywear from the moment our baby was born. We recommend carrying the baby in an upright position. The baby should always face the carrier person’s body when placed in the carrier. Always check the tightness of the knot and the bond! The sling or carrier should always reach at least up to the armpit of the baby. If the baby does not hold her head on her own, the carrier must support the nape or the middle of the head as well! Prevent any objects from getting in front of the baby’s nose or mouth that could block the airways! When travelling, always use a seat that suits the vehicle! On public transport, always be aware of the placement of the baby, and pay attention to her safety as well! While wearing your baby, do not carry out life-threatening or sudden movements! Pay special attention to the child’s safety around hot or sharp objects! The manufacturer of the baby carrier is not responsible for any accident that may happen while you wear your baby in the carrier! For professional advice, you may contact the Nandu manufacturer advi- sor or a babywearing advisor.